Electric start, this superb looking bike is equipped with the latest features you ever expected in your dream bike. 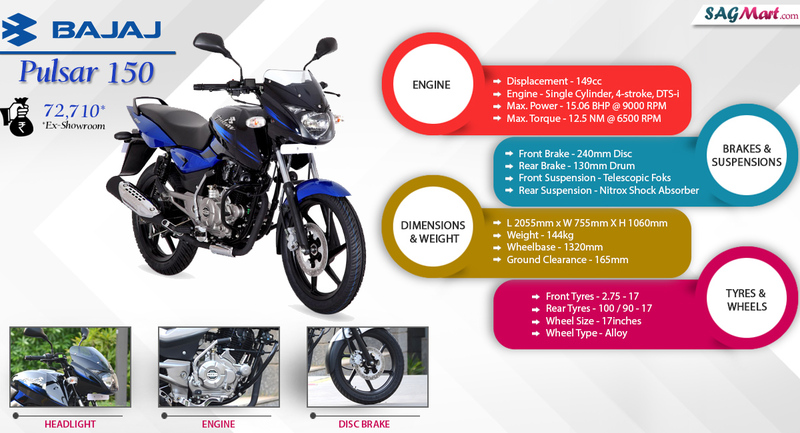 Engine quality, power and mileage are the most promising features you can see in the Pulsar 150 to fulfill all your requirements. The Pulsar 150 series has been designed to give maximum comfort to the riders. And, it gets a single unit seat that gives a comfortable sitting position to the rider and pillion, while the clip on handlebars gives sportier riding position. The maintenance of Bajaj 150 is very good, it doesn’t require much maintenance. And, the spare pasts of this bike are not costly and easily available in the market or service stations. The Pulsar is one of the best bikes for street ride and In terms of style and performance; the Pulsar 150 competes with other motorcycles in its category. Furthermore, the Pulsar 150 is available in three shades. And, the affordable price has another reason to have looked at this bike.